How cool is this? Charity buzz is auctioning 4 VIP tickets to the Project Runway finale! Bidding is up to $6,100 and ends February 3rd. Oh, if only …. Includes: 4 VIP tickets to the show. The winners will be seated in the 2nd or 3rd row. You and your guests will receive a backstage tour and will be introduced to one of the former or current contestants attending the show. Show is at Bryant Park February 12, 2010. Make it work! Fierce! Where is my chiffon?! Project Runway is back and this season has been better than ever! Tune in as designers go head-to-head, battling it out for the top spot on this incredible reality TV phenomenon. With this package you will have four coveted tickets to the unveiling of the top designers lines at Fall Fashion Week 2010. Project Runway is a Peabody Award-winning American reality television series on the Lifetime network which focuses on fashion design and is hosted by supermodel Heidi Klum. The contestants compete with each other to create the best clothes and are usually restricted in time, materials, and theme. Their designs are judged and one or more designers are eliminated each week. The show culminates with the final designers presenting their work at Fashion Week in Bryant Park, NYC. Be there as the finalists display their finished work for the first time, see who is crowned the new king or queen of fashion and who is bid Auf Wiedersehen by Heidi Klum. We are so lucky to have a piece of true, timeless art on our website: this stunning runway collection chiffon dress by Vera Wang. It’s now on sale for $799.99 at www.TraTutti.com. 60% of the sale of this item will go to Project Sunshine – they are both the benefiting charity and the consignor! Project Sunshine is a nonprofit organization that provides free educational, recreational, and social programs to children facing medical challenges and their families. This stunning Vera Wang gown was donated to Project Sunshine from a high-level contact at W Magazine and Tra Tutti has the dress listed on our website for them. It’s right off the runway, from the Vera Wang 2008 Fall Collection. I … might … like … fannypacks … Hear me out! Did you know that the fanny pack also goes by belt pack, belly bag, Buffalo pouch, hip sack, hip pack, bum bag, Joe bag, or man bag??? Who knew!? Thank you, wikipedia. To some, myself included (gulp, I can’t believe I’m saying this out loud), the resurrection is a form of WELCOMED, ironic, retro fashion. 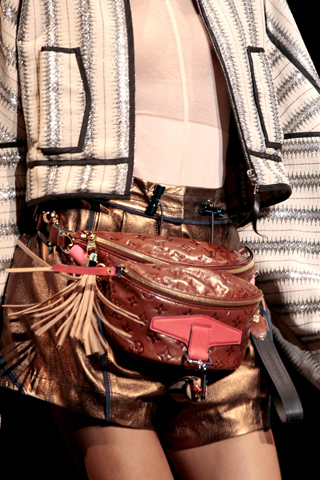 At first I was horrified when I began to witness the comeback in recent years by Gucci, Prada, Coach, Marc Jacobs, and Louis Vuitton (photo to the right from the LV 2010 collection) … but the redesigned fanny packs are cute and kind of useful! I’m not going to rush out buy one just yet, but I’m just admitting that I’m considering it. There is no fashion label more playful, quirky, or irreverent than Moschino. And there is no actress more adorable, empowering, and fabulous than America Ferrera. So … put them both together and – Sha Zam! Last week America Ferrera joined co-star Vanessa Williams at a Save the Children Benefit in Soho. Ferrera wore a crepe Moschino dress with safety pin detail from the brand’s Fall 2009 collection. Scoop up Moschino for a fraction of the price at Tra Tutti! These Models are Flat – in a good way! Tra Tutti salutes you Marc Jacobs! On behalf of women’s feet everywhere – thank you for a runway show featuring flats! Visit Tra Tutti for a large array of designer shoes (including those by Mr. Jacobs) for 60-90% off original prices. A shoe that I like to call the “WTF Shoe” has been popping up all over the place! However, less insane, slightly more wearable versions of this trend seem to be everywhere I look (now that I’m obsessively looking for them). For starters, the versions we like may have a crazy heel, but at least they have a heel unlike Poshies shoe. And what’s more interesting …. we find ourselves so drawn to this new structured, handcrafted shoe trend. We’d love to know what you think. One lucky size 8 Tra Tutti shopper will be able to scoop up a pair for a bargain price. If you love them like we do, our Pour le Victoire pump is a fraction of the $1,000+ price tag most of these shoes seem to carry. I hated leggings and bubble skirts at first. But after many moans and groans about disliking the trends, I warmed up to bubble skirts and I am now addicted to leggings. I am often wrong, and I admit that. Stirrups & Body suits: ARE YOU FOR REAL?? I mean, I guess if my arms fell off and I couldn’t just tuck my t-shirt in I would consider buying a body suit. But then again … how would I do the little snappy things with no arms? And as for the stirrups, why does the bottom of my foot have to be itchy in my shoe just to accomplish the same exact look as leggings? And it’s not just fashion-forwardies like YSL and Miu Miu that are doing it, they are popping up everywhere. Run, because these trends are coming for you. Would you wear either of these trends? Tell us in the comments section.